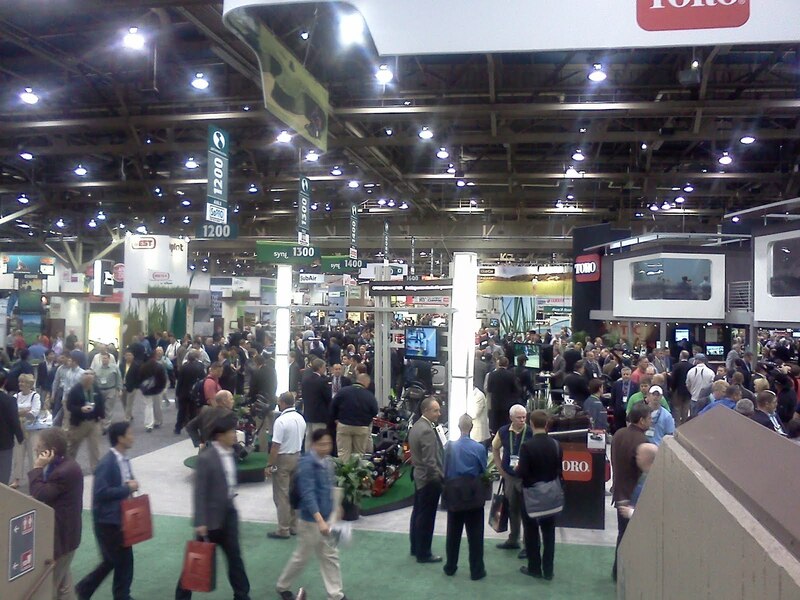 Spending the next day and some going through well over 250,000 square feet of tradeshow space. Looking for the next great product in turf management to maintain Glen Echo CC. 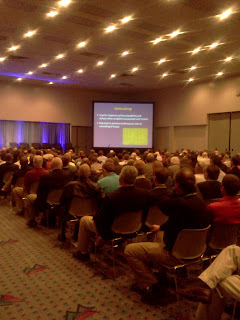 I am attending the national superintendent conference this week in Las Vegas. A quick trip since we have so much activity taking place at the club. Arrived Monday evening and will be leaving at noon on Thursday. Picture below is a session on BMP in dealing with anthracnose which is a disease we get on our poa that contaminates our greens. Zoysia dormant RoundUp application working. 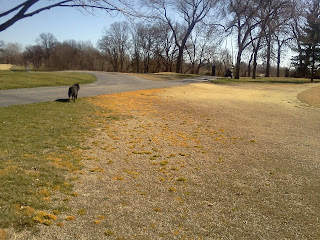 With the warmer temps, the dormant app of RoundUp is moving through the poa plants of the fairways and tees. The material was applied about 4-5 weeks ago. 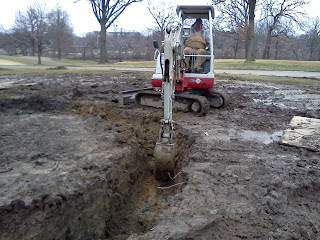 The picture below is from the area near #2 green and its surround. The contractor(Wagner Construction) who is doing the work for Metro is completing their responsibilities for the project. One of the requirements was to move the mounds to the right of #1 fairway per our recommendation from our Master Plan. A majority of that work was accomplished today. 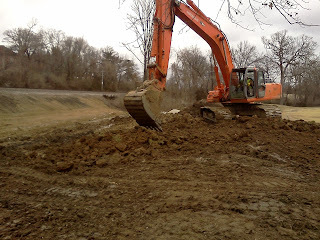 I asked the contractor to leave a portion of the mound so we can use that soil to tie our existing fairway into the planned widening of the fairway. 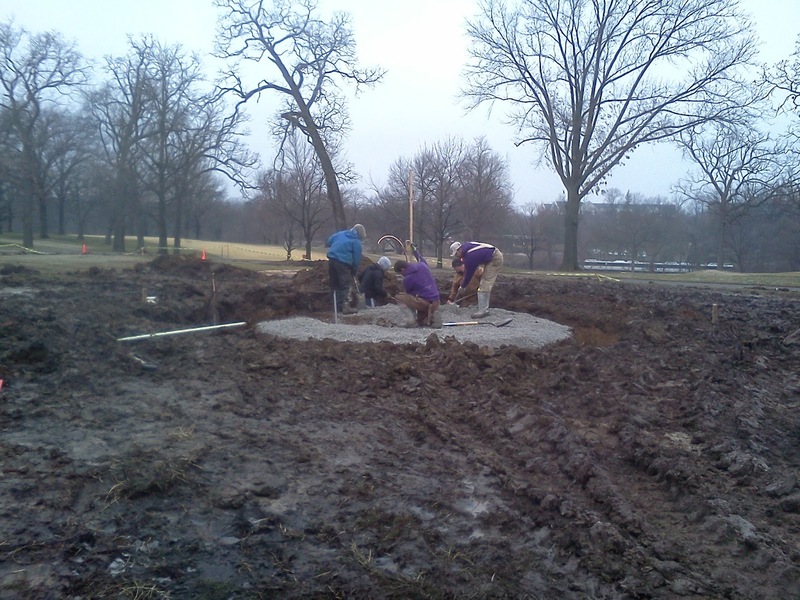 We have two catch basins and drainage swales to put in place plus the drainage which well reduce the overall moisture that will remain in this low area of the golf course. 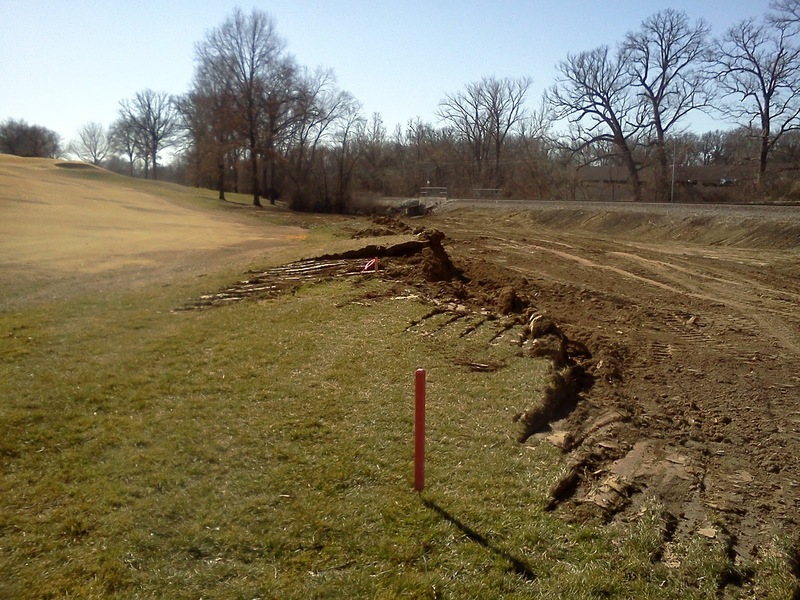 We are waiting on our sod provider to give us the okay that they can cut sod before we begin this work Some of our work will require sod to be removed from the fairway and we do not want to do further disruption to the area until sod can be cut. The road leading to the area will be sodded as well. 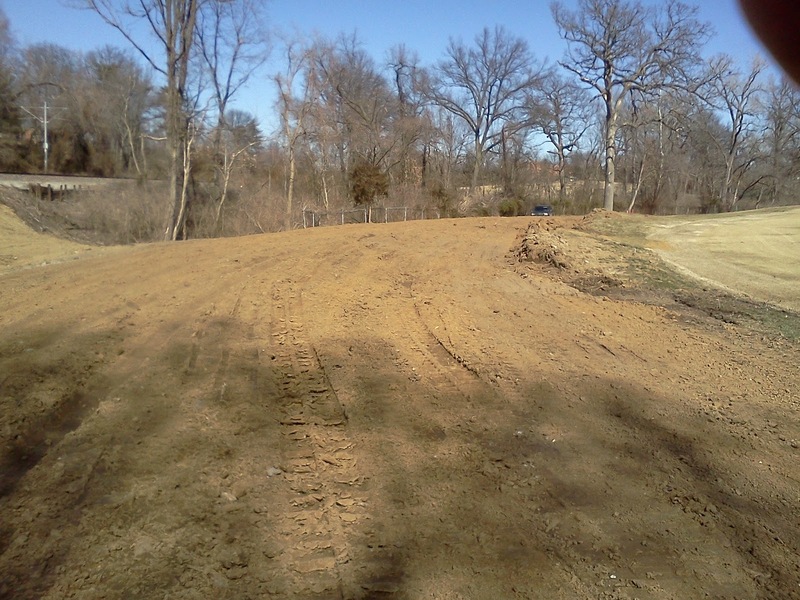 The contractor will also be doing some asphalt repair in our maintenance area and from the rear gate to the top of the hill near the short range parking area. A tentative schedule for this work is planned for the week of March 5-7. We will keep you informed of potential changes in gate opening and closing as we get closer to the date. 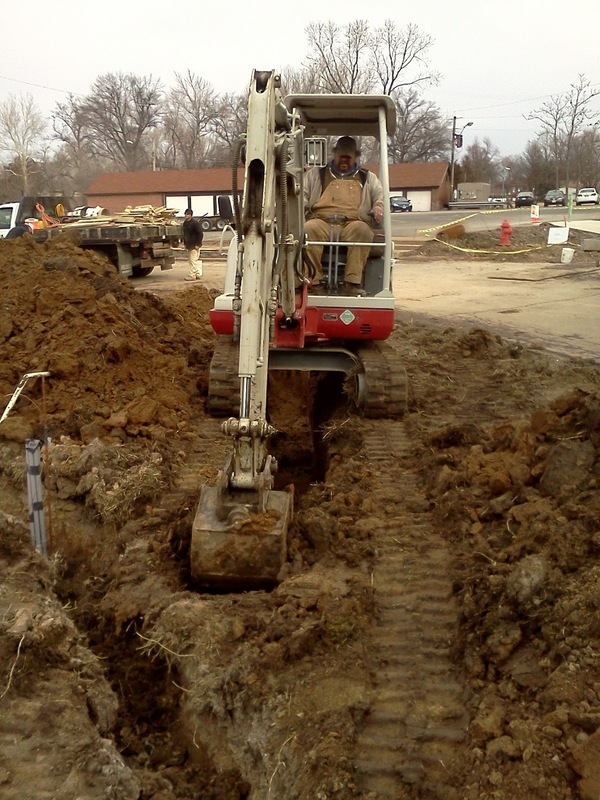 Expansion of our parking area as a part of the agreement in allowing access to the project area. 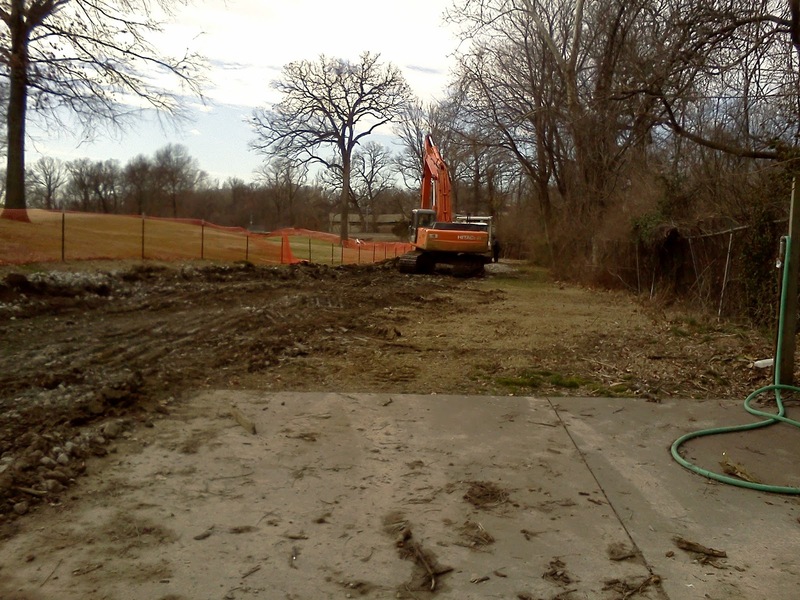 Roadway being removed along #1. 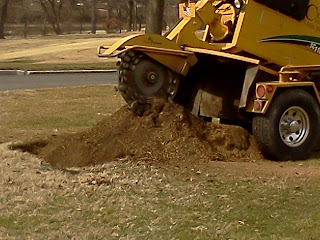 Trackhoe breaking down the mounds. 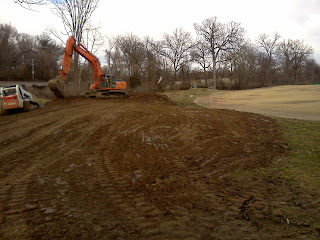 Dirt mounds being lowered and spread to improve overall playability of the right side of #1 rough. 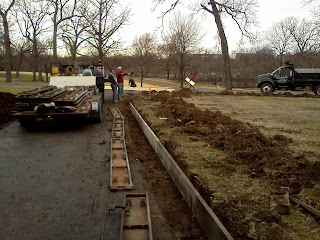 Trackhoes moving the soil from the second mound toward the fence line. 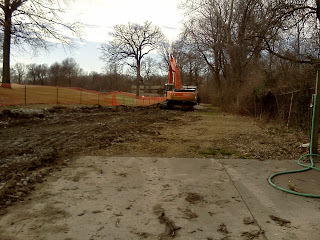 View from the large oak gree toward #1 green. The mound on the left will be used to transition between the existing fairway and the new widened fairway and improved rough area. Same view as above but a little closer look of the area. Looking back from the direction of the green back around the turn. 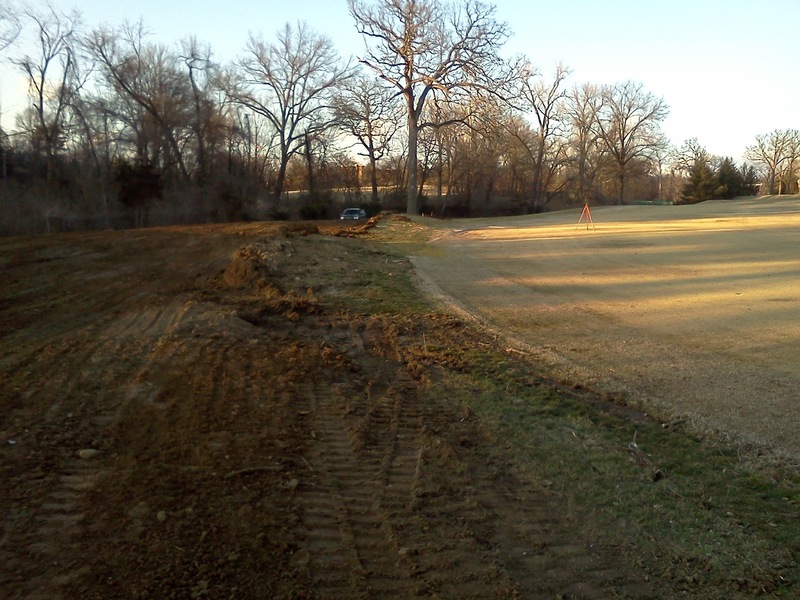 Fairway will be expanded approximately 5-8 yards into the mounds that are on the right side of the picture. Looking back toward the tee. 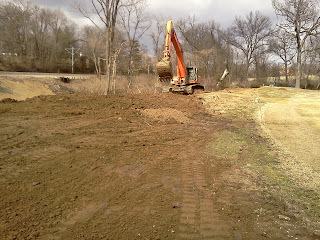 The earth moving for #1 rough is beginning today. Full report later. 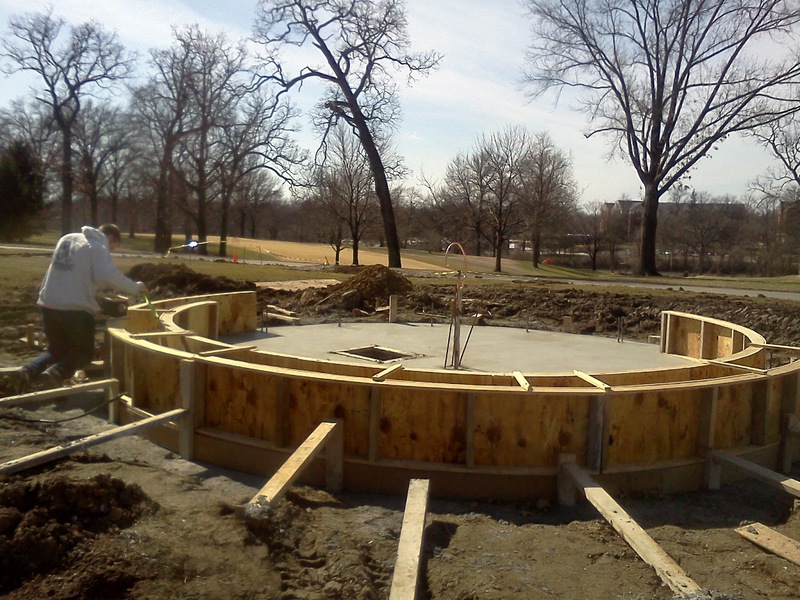 Work continues to progress on the Pierson Memorial. The walls were poured yesterday on the fountain pool and the forms were removed today. 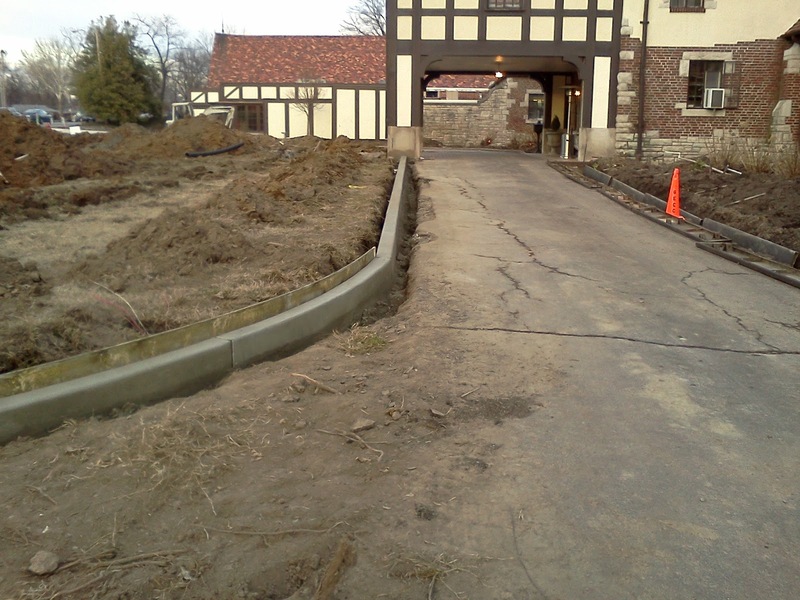 Forms for the inner circle curbing were put in place today and one section of curbing was poured. 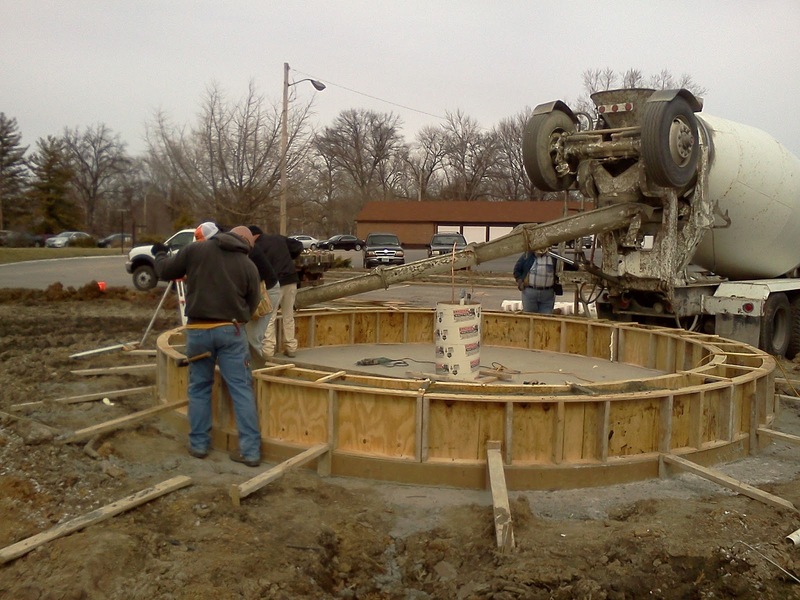 The remaining inner circle should be formed up on Friday and the curbing will be poured. Asphalt curbing in front of the living room and around the corner to the scoreboard will be removed and replaced with concrete by Glen Echo to repair damaged curb and give us a consistent look in the area of the clubhouse. We will also be replacing curbing along the practice green and #18 which was lost last season because of the overlay that was placed on the damaged asphalt along this area. Without the curbing, water runs directly from the roadway across #18 and #1 fairway leaving these areas wet for a longer period time. The new curbing will direct water into the storm sewer. The walkway in front of the Olympic entrance will be sealed tomorrow and that entrance will be opened next Tuesday, February 28th. 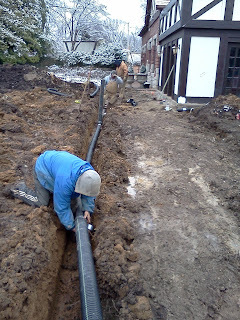 Our staff has been busy today digging drainage lines from the Olympic room area, across the new plaza area which will then connect all front gutters and will also drain the fountain pool. This area will be back filled on Friday. 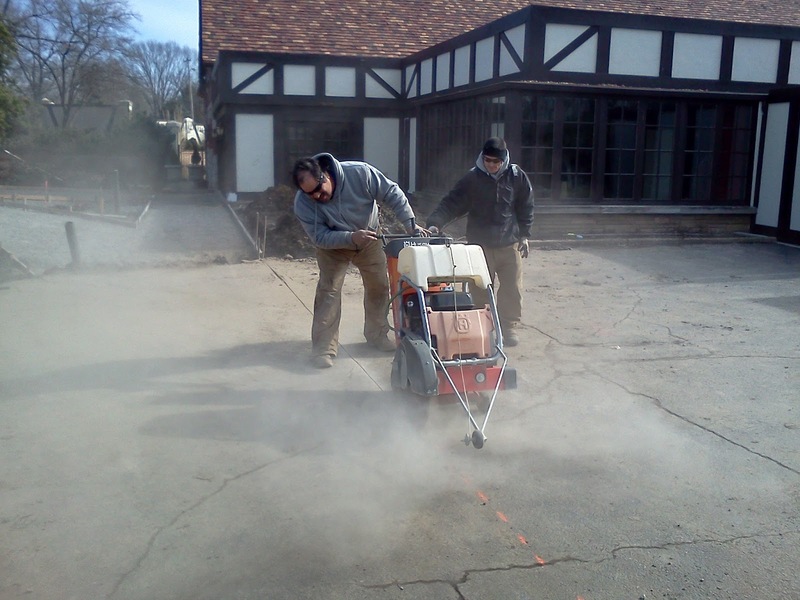 Soil is being removed from the fountain and plaza walkway areas in preparation of the forms being put in place by next week. 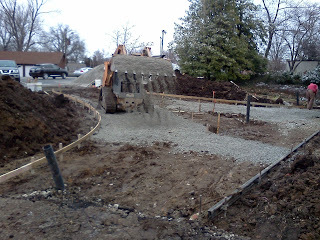 Four inches of rock and four inches of concrete will be put in this area. 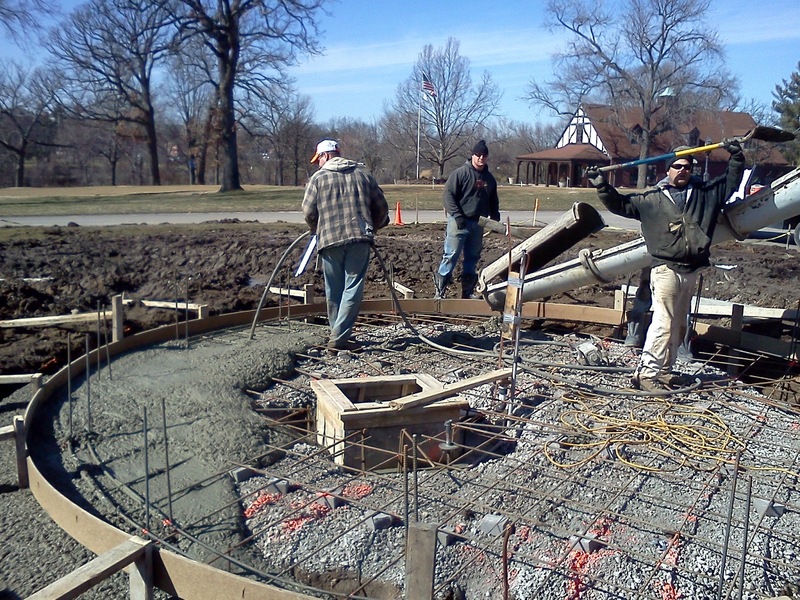 Concrete being poured in the forms for the fountain pool wall. The finished pool wall. 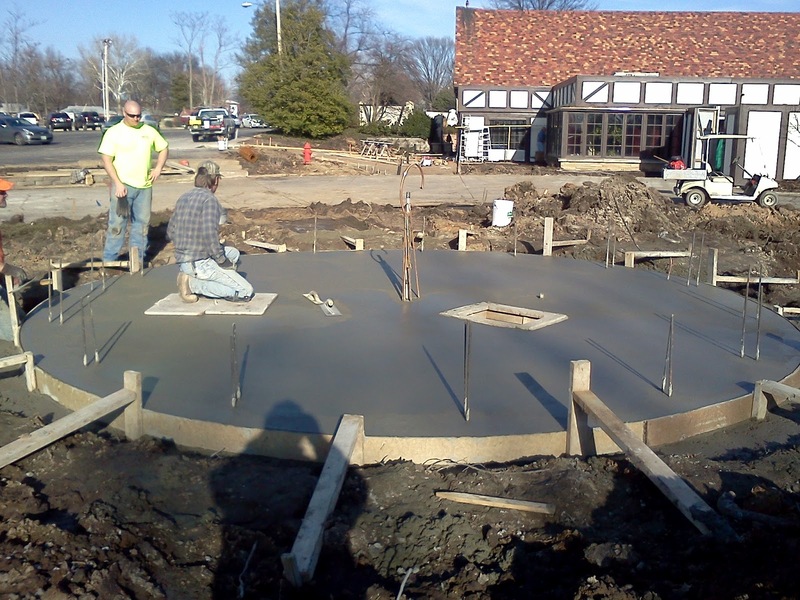 There will be a 4" limestone cap placed on top of the wall and a red brick cap will be place on the fountain wall the same color as the brick of the clubhouse. 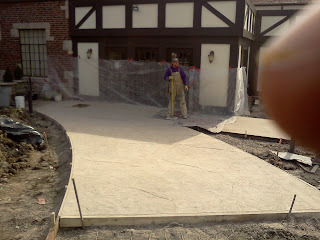 Ornamental lines were cut into the concrete walkway yesterday. The Olympic walkway was washed yesterday and will be sealed tomorrow. 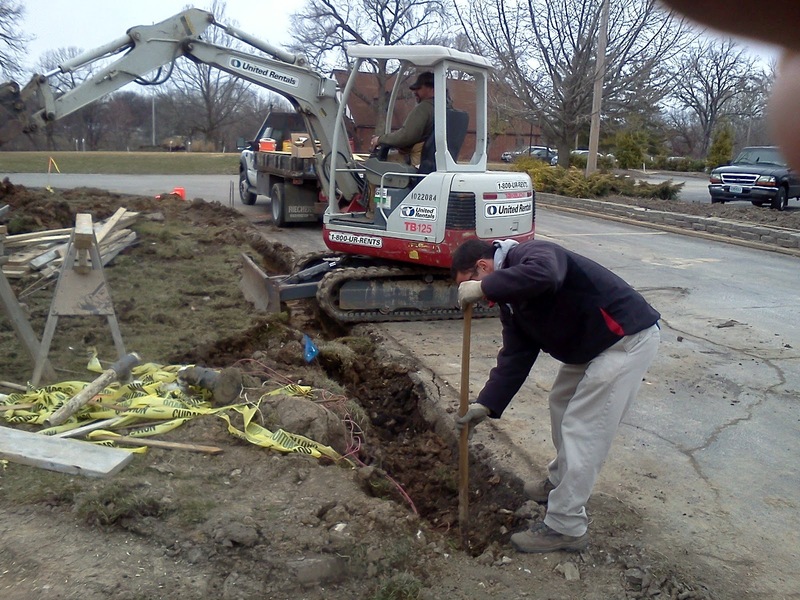 Our staff digging out the curb area in preparation of the forms being put in place. Oreo Botta staff putting the forms along the curb. Our staff putting sleeves under the curbing forms so that drainage can then be installed. 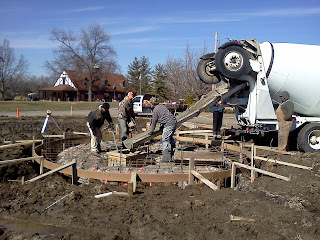 Concrete being placed in the forms today. Our staff will have to back fill soil behind the curbing once it is cured and new asphalt will be placed between the old asphalt and the new curb in the next few weeks. 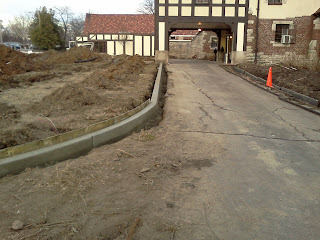 The new curbing on the inner circle toward the portico. Skip digging the drain line that will carry drainage from surface drains in the Olympic room entrance, the gutters on the front of the building and drain the new fountain pool. 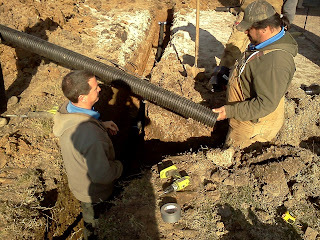 Skip and Russ attaching the new 4" drain tile. 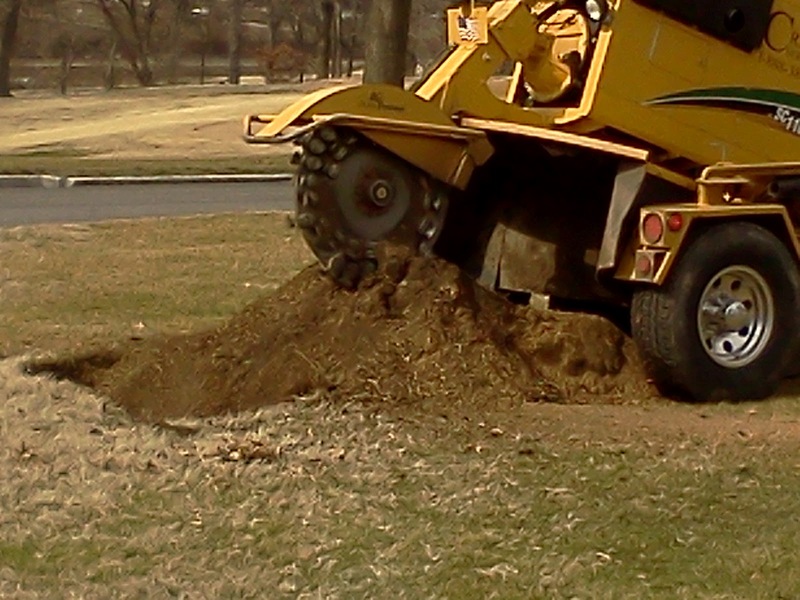 Our contractor came in yesterday and ground 15 stumps that were in need of being ground. Over the next couple of weeks we will be picking up the remnants of this material, in some cases we will need to add additional soil and then they will be sodded. 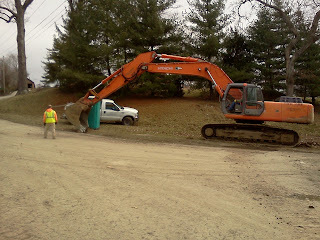 Crews Contracting service with their monster stump grinder. 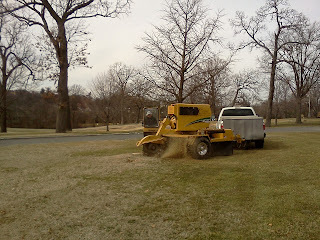 Unbelievable how quick this machine will grind a stump. The remnants of a 24-30" stump. The concrete was poured for the Olympic Room entrance and walkways on Monday. 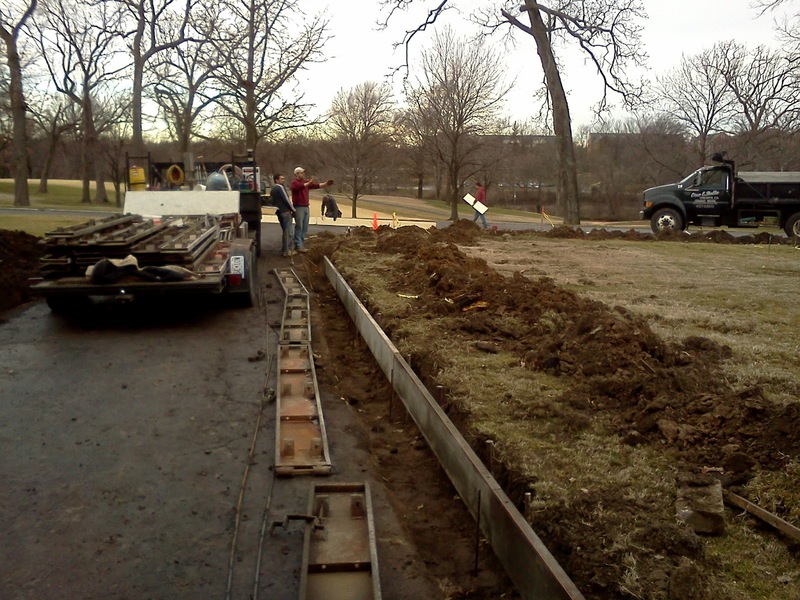 The walkway handrails are being measured today so they can be fabricated and will be installed in the next few weeks. 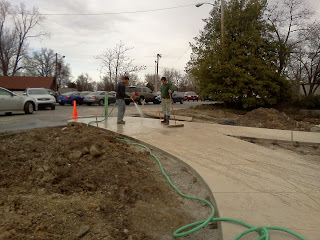 The concrete will have saw cuts placed in them tomorrow for design purposes. It will then be washed and sealed by Thursday. 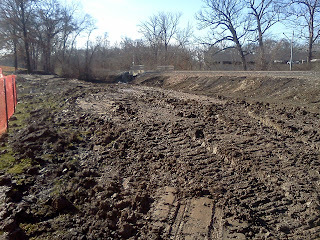 Access to these paths will not be allowed until next week. 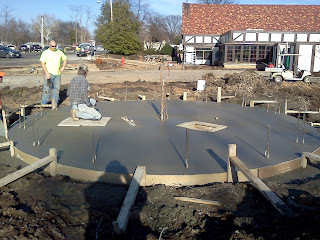 The fountain walls and pedestal for the water and fire feature will poured on Wednesday. 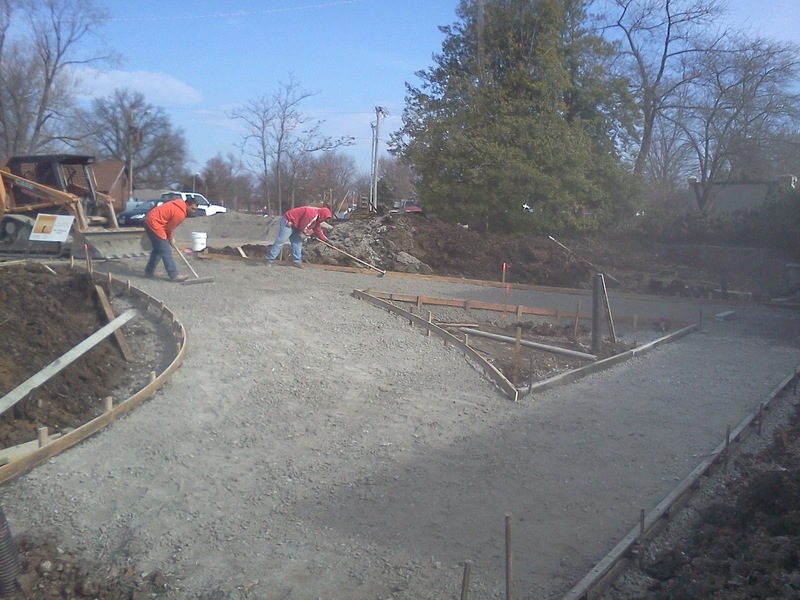 Our concrete contractor will be working on curbing next week and will be doing some grading around the fountain area in preparation for the forms to be set in place. 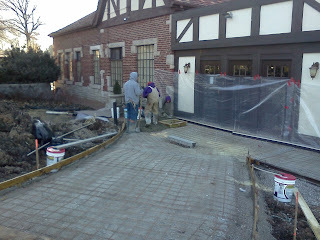 The plaza walkways should be under construction by the week of March 5th. Our staff has some demolition work involving removing asphalt and digging out the sub grade in the area of the truck unloading area and on both sides of the portico. 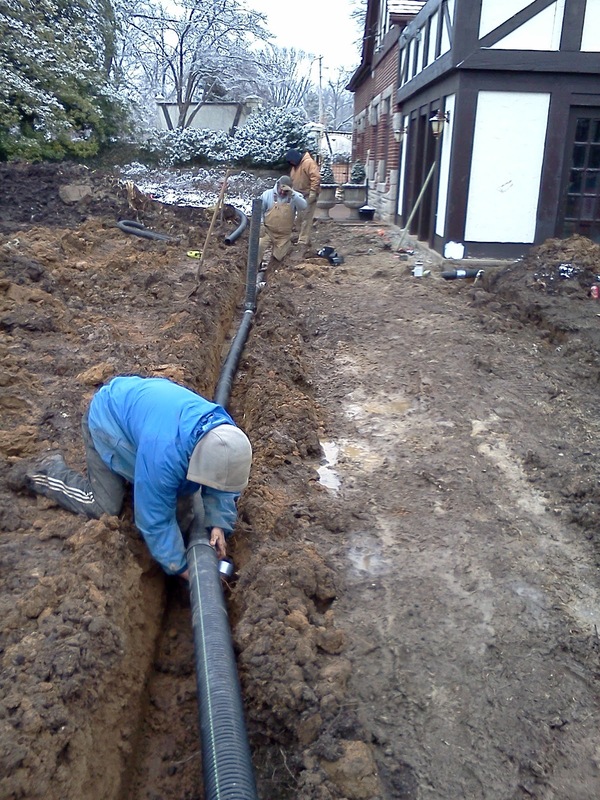 Drainage pipes for the Olympic Room entrance area, driveways and new drainage for the gutter downspouts will all be connected to a main feeder line that will run across the front yard area. This will all be tied into the storm sewer that runs across #18 and #1 to the creek. 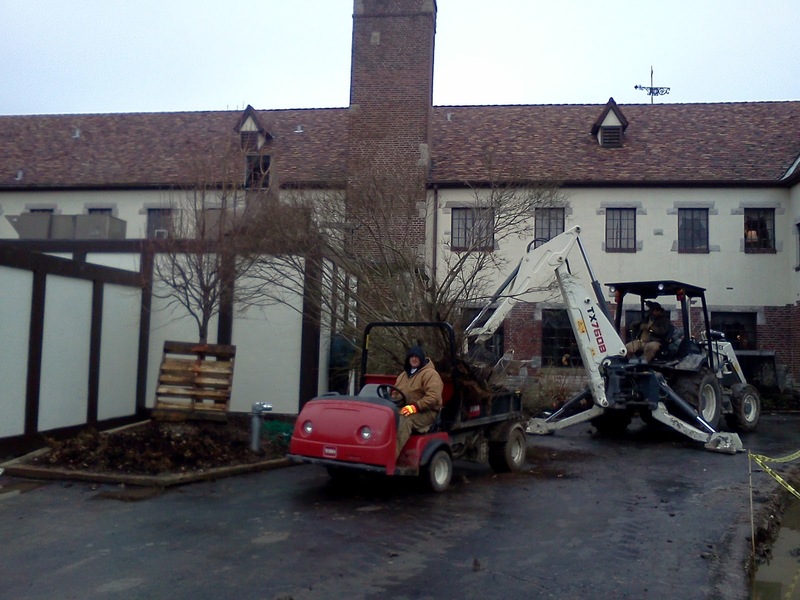 Our staff will be involved in getting the soil put back in place for the beds to be planted in the Olympic Room area and in front of the main dining room and living room. These areas will also be put back to grade for our lighting installer to get the walkways and up lighting installed to the building. 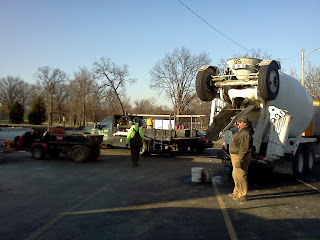 Skip waiting to assist in loading concrete into the hauler. 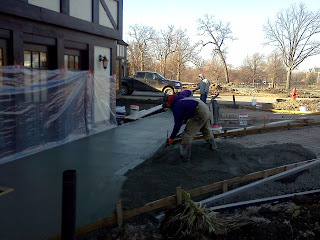 Oreo Botta staff installing the first concrete at the Olympic Room entrance. Color being thrown on top of the concrete. 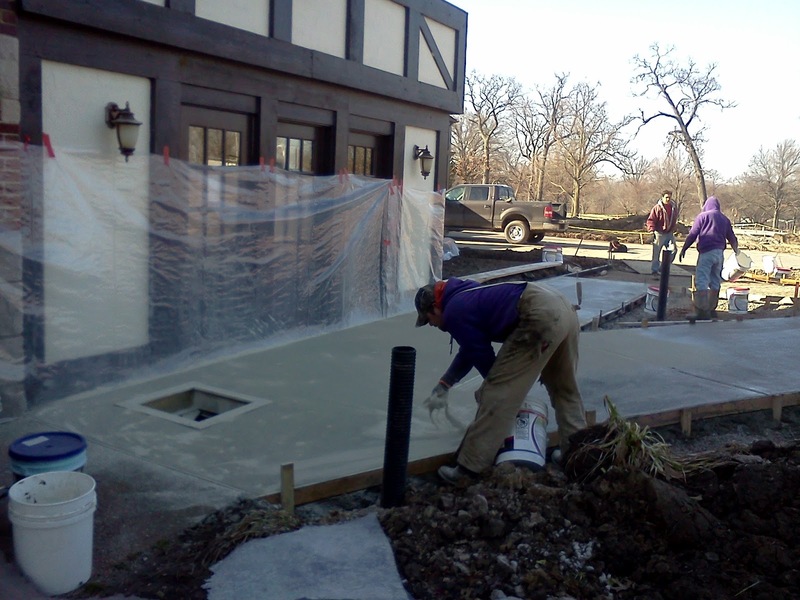 The material was trialed into the surface of the concrete and a second application was made and it was then trialed into the surface. 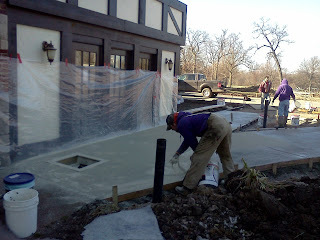 The look after the concrete was stamped. I forgot to show this application. 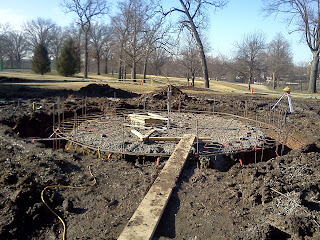 I will show it when the fountain walkway is completed. A mat material with a rubber backing in laid on the concrete and is then tamped which creates the look above. 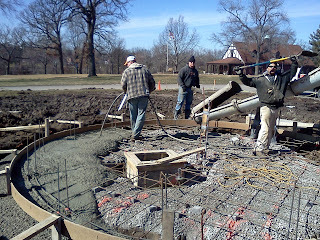 The completed concrete. 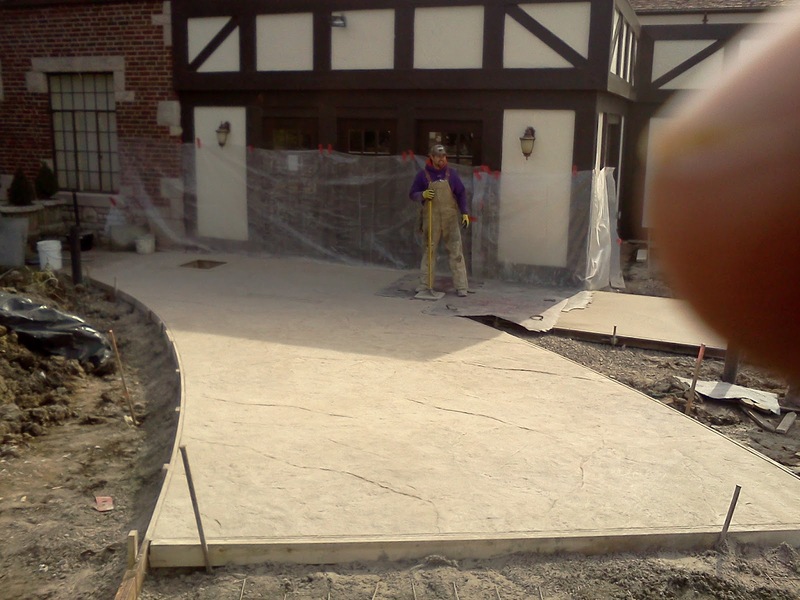 In the background is the handrail fabricator who is measuring the amount of handrail needed for the walkway. Hoette Concrete Construction putting together the forms for the fountain holding area. I pulled it up this morning and saw the parents changing spots on the eggs which was interesting to see. This site also has sound with its camera. As I was typing this blog, the eagle on the nest started calling. It flew off the nest and about 5 seconds later the other eagle flew into the nest. It took the second eagle at least two minutes to get back on the nest. The box culvert along #1 has been completed covered with soil and rough graded by a dozer. The old ditch area has been filled with over 10' of box culvert and soil which has drastically raised the level of the area between the metrolink and mounds along #1. 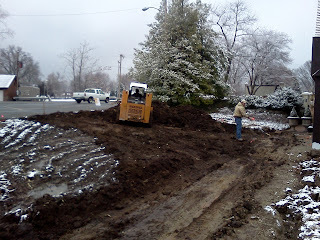 We hope to move the soil from the old mounds in the next couple of weeks. This soil will be pushed toward the fence line and will be rising slightly to the fence to assist balls in staying in play. This will also force the water to the catch basins and we will then pipe the water to the ditch. The fairway will moved approximately 5 yards to the right and will be sodded with zoysia. 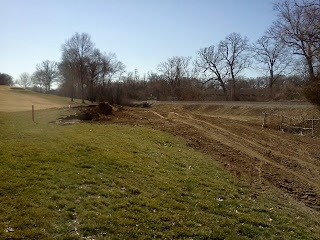 The remaining area damaged from the construction will be sodded with fescue. The view looking toward #1 green. 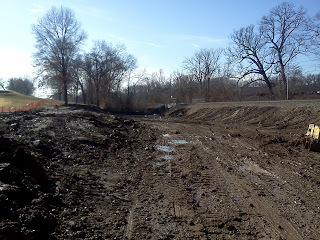 I'm standing on the back side of the mounds looking approximately 3' below to the new level in the ditch. 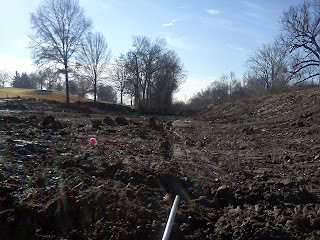 The view from the fairway side of the mounds looking toward the ditch. 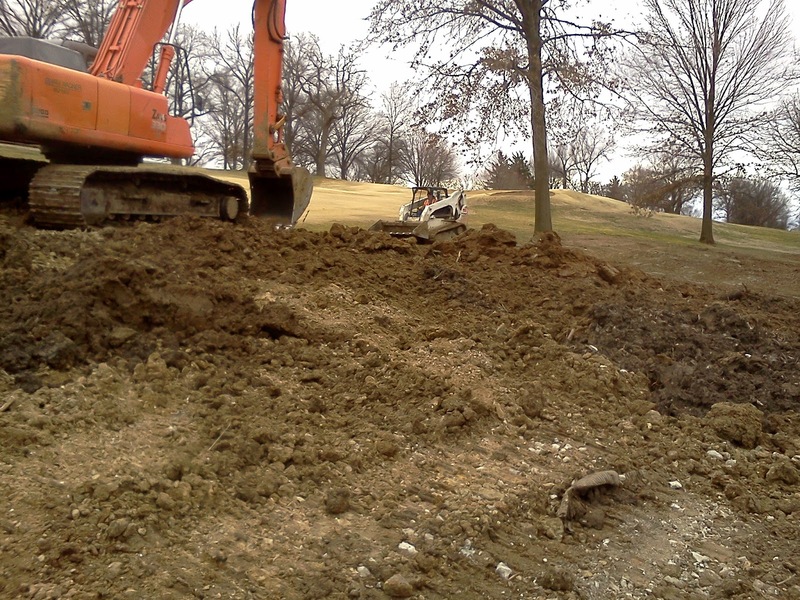 The soil in the foreground will rise gradually to approximately 2-3' above the edge of the fairway. Great progress has been made this week. 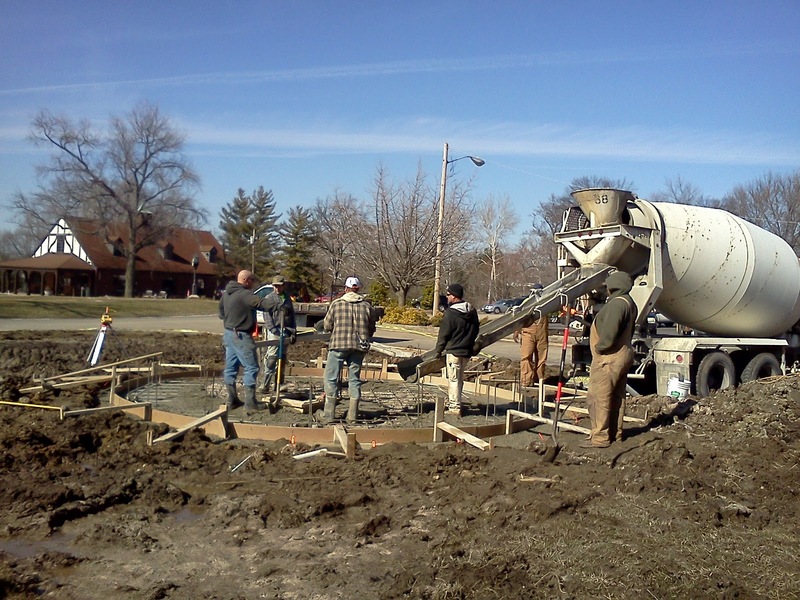 The first concrete for the project was poured today for the foundation and floor of the fountain. 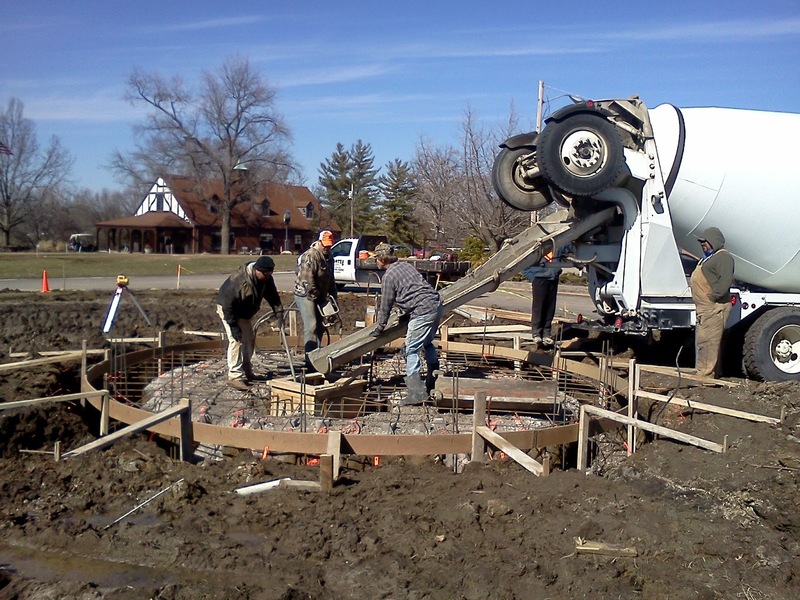 Approximately 22 yards of concrete were used. 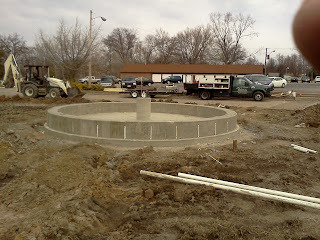 Monday the forms will be put in place for the fountain walls and we expect to have them poured on Tuesday. 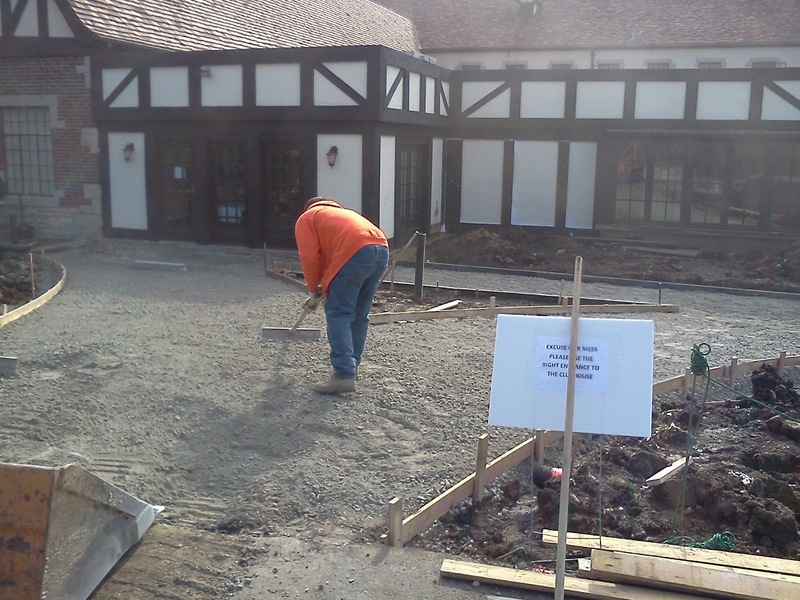 The walkways in front of the Olympic Room entrance is scheduled to be poured on Monday. We expect the Olympic Room entrance will be ready for use on Tuesday, February 28th. Staff assisting our contractor in getting the base of the fountain prepared for concrete on Thursday. Our staff removed the plants from in front of the clubhouse. 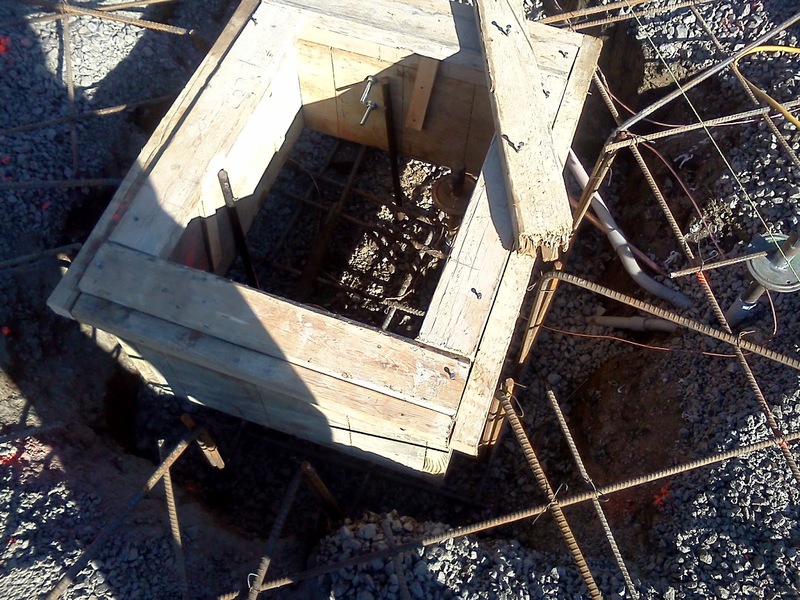 Rebar being installed for the foundation and fountain floor. Work that is not a part of the Pierson Project but was in need of repair. 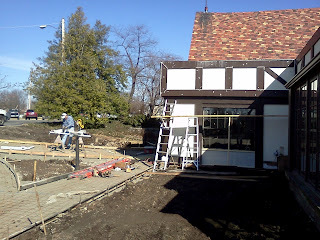 Dale Plaggenberg removing the old door and framing in a new window. 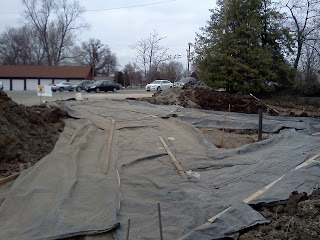 Our staff installed drainage along this area to reduce future water issues. The sump framing which will hold our drain and pump for the fountain. 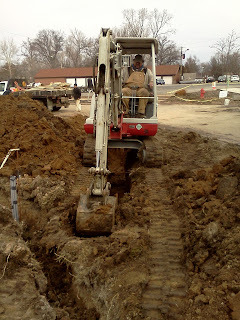 Our contractor beginning their concrete work. The first truck almost empty. New window in place and framed. Dale in the left background. The finished product 22 yards later. 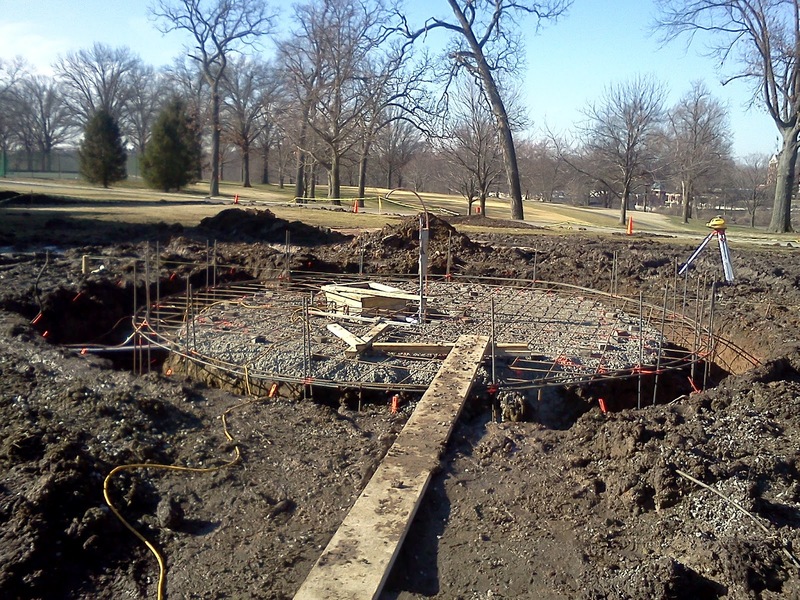 The walls of the fountain will come up 16 inches from the top of the form and will then have a 4" limestone cap placed on top. This will be at a height for anyone who would like to sit and relax and enjoy the view. The Bald Eagle Cam from Harrison Bay has the eagle on the nest with two eggs laid. A great closeup! In my last post regarding the Marvin Pierson Plaza work, I mentioned that the Olympic Room entrance could be open tentatively by February 18th. I looked at the calendar incorrectly and the date should have been posted as February 25th. With the snow on Monday evening and rain predicted for Wednesday, the date of the 25th could be pushed back slightly. 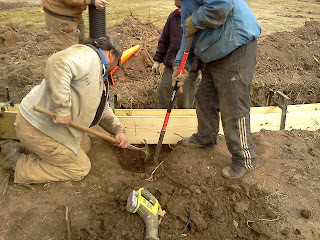 I will make a post late in the week as work begins again after a couple of days of weather delays. Work is in full swing on the Marvin Pierson Memorial Plaza in front of the clubhouse. Our staff along with Oreo & Botta Concrete Company are beginning to put into place the walkways near the Olympic Room entrance. The area has been formed, rock and wire mesh laid in place and the area will be blanketed to keep the freeze from entering the ground over the next few days. 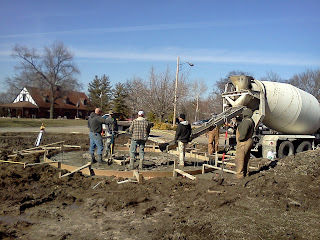 The plan is to pour the concrete late next week. 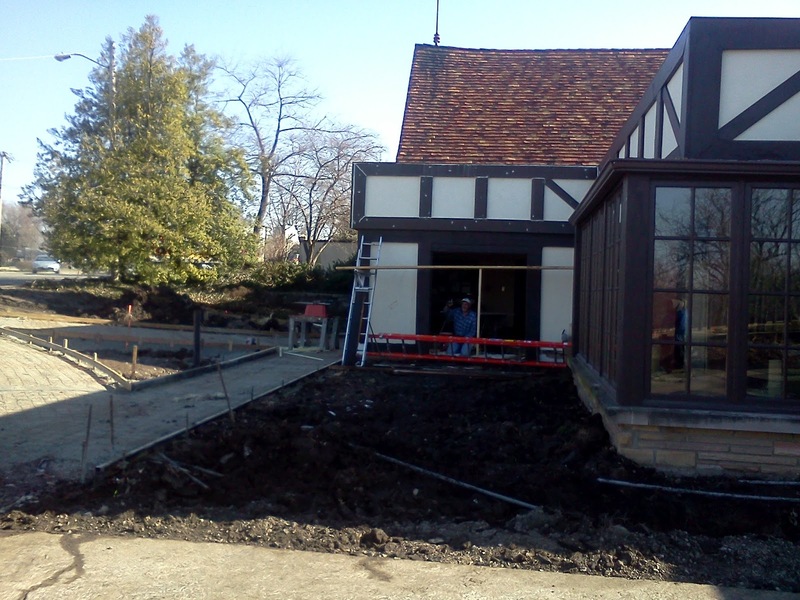 Tentatively, the Olympic Room/Members entrance should be open by February 18th. Plumbing will be put in place tomorrow for electricity, water, and gas so that the concrete foundation for the fountain and pool can be poured early next week. 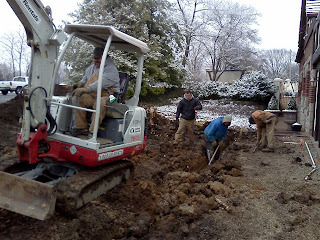 Our staff continues to dig out the footings for the concrete curbing. 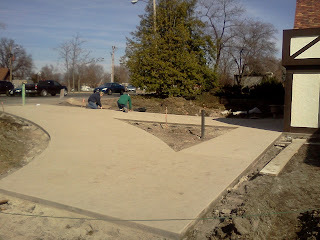 Once the fountain pool is complete, the layout work will begin for the fountain and plaza walkways. 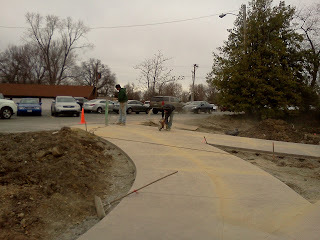 Staff from Oreo & Botta Concrete preparing the Olympic room entrance walk paths. 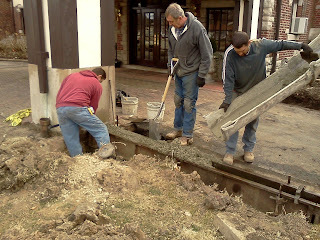 Skip, Tom, Russ and Jason installing drainage along the lower walk path in front of the Olympic Room and Member's Entrance. 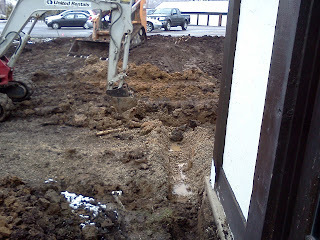 Drainage placed along the double door of the foyer for the Olympic Room entrance. Skip expanding the area around the fountain for our contractor. 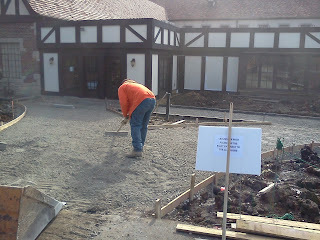 Staff from Oreo & Botta laying rock in the formed walk path area near the Olympic Room entrance. Skip and Tom cutting the asphalt in the loading area. A walk path will be laid across the loading area and will connect to the plaza area in front of the portico. Staff from Oreo & Botta smooth the rock in preparation to be packed with a vibratory plate. A view from the opening in the parking lot down to the Olympic Room entrance. Easy access for all with a wide opening. The walkway to the right will lead members and guests to the plaza area and the formal entrance to the club. The uneven steps will be closed off and removed and the planting bed along the loading/handicapped parking will be expanded. The new walk area covered by thermal blankets to reduce the potential for freeze to get into the ground over the next few days of real winter that we are expecting.